Nearly all the code is in class modules, so it doesn't collide with your existing modules. 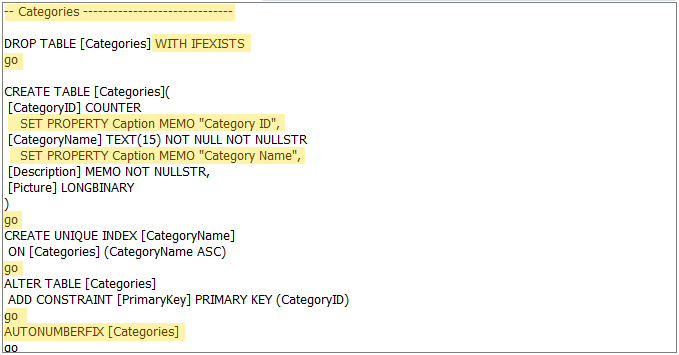 All the libraries are accessed as methods of the 'xf' object (think of it like the Access 'application' object), so you get intellisense along the way. Many of the small number of public global methods are named with the 'xf_' prefix to further decrease the risk of collision. In fact, it might be a problem that not enough of the framework's methods are available in the global space (so you can use them in SQL or in Control Source properties). Don't worry, you can expose them in a controlled manner with you own custom module! The minimal (code-only) configuration of the framework puts no demands on you or your code at all, but gives you the utility belt of code libraries and additional classes. The standard configuration, adding automated front end updates, back end schema updates and table linking, requires only that you drop a single identifying table into each of your back ends and call xf.AutoStart on application startup. Standard configuration also gives you a Control Panel form to make managing feature settings and using the framework tools a no-brainer. The framework has a handy setup form that imports and configures the rest of the framework - you don't have to think about a thing. It can also completely remove itself (handy when upgrading to a later version of the framework). If you tick the Control Centre option of hiding all the framework objects, you might even forget it was there if it didn't leave the base module visible as a reminder! The framework is completely 64-bit-Office compatible, and is distribute as an unlocked MDB file, meaning zero integration and deployment hassles with new or existing projects. 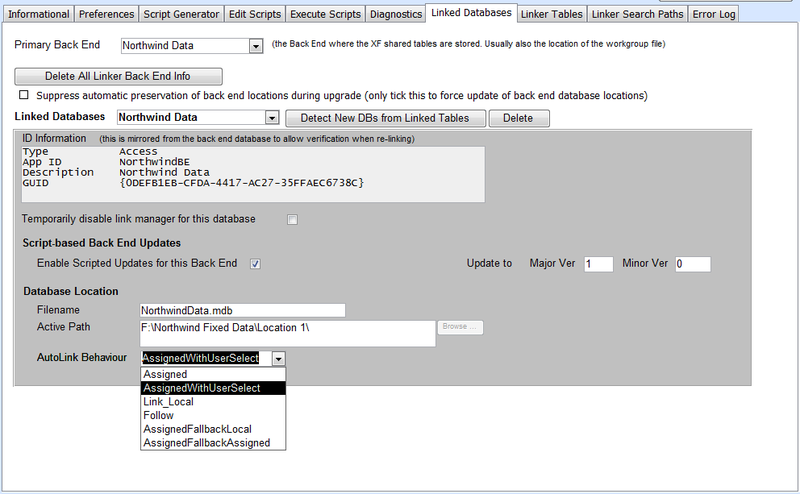 Linked table information is saved in a local table so that even if all linked tables are removed they can be recreated. The linker is integrated with the front end update process so that linked tables don't need to be configured for the production environment before releasing an update. The framework can monitor a designated network folder for newer versions of the application, and automatically update to that version. Linked back end information is copied to the new front end as part of the update so that the new front end may re-link to the production environment on startup. The pre-processor screens the SQL script and where enhanced syntax is used, implements the commands using direct DAO or ADO manipulation. 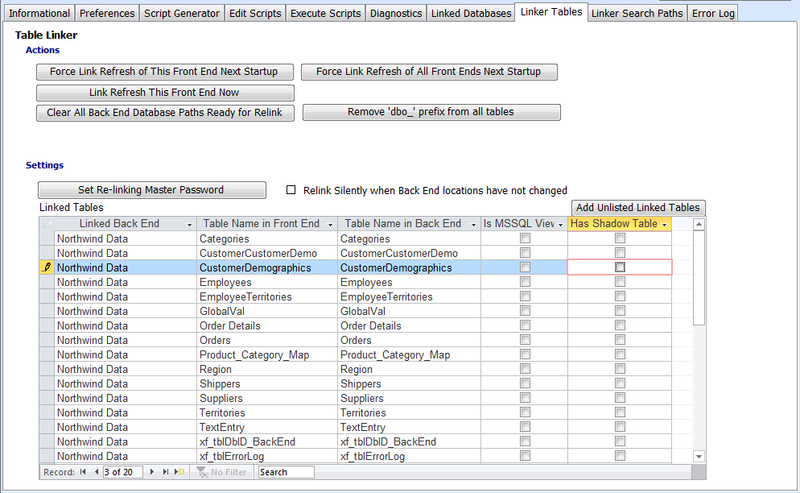 Non-enhanced commands are passed direct to the SQL engine. This allows the processor to both compensate for the well-documented deficiencies of built in DDL, and offer powerful enhancements to deal with native Access field properties. 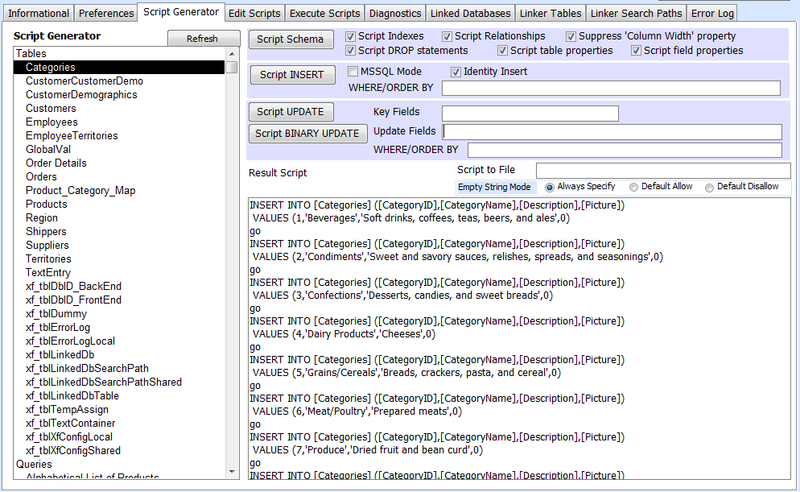 The Control Centre offers script generation tools, like MSSQL Management Studio, to create augmented SQL scripts for DDL (schema) and DML (data). 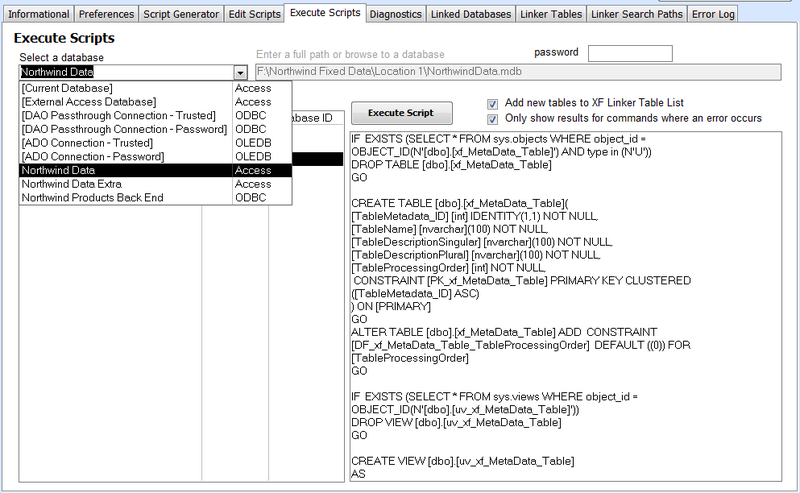 It also offers a script editing window and a script execution tool, allowing you to run a script against any database anywhere. 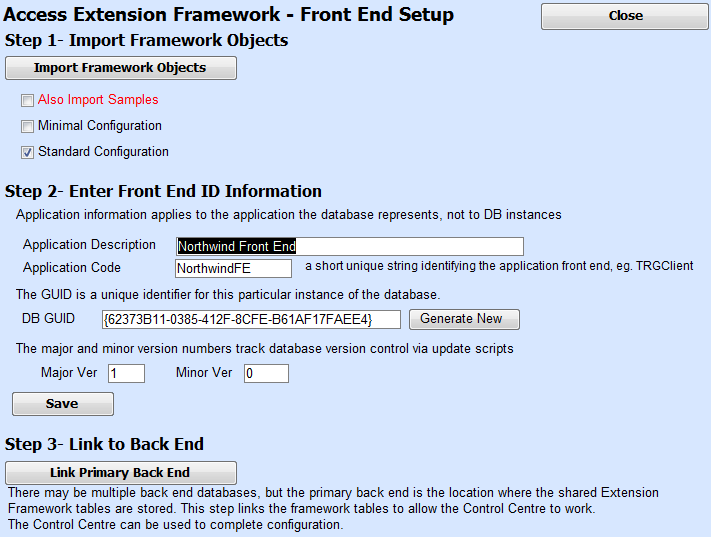 Back end databases are assigned a major and minor version number, and the front end can be used to deliver and automatically execute scripts to update the back end to the latest version. Each script updates a particular back end from one version number to the next, so it's not a problem for the update tool to update several back ends and many version levels. 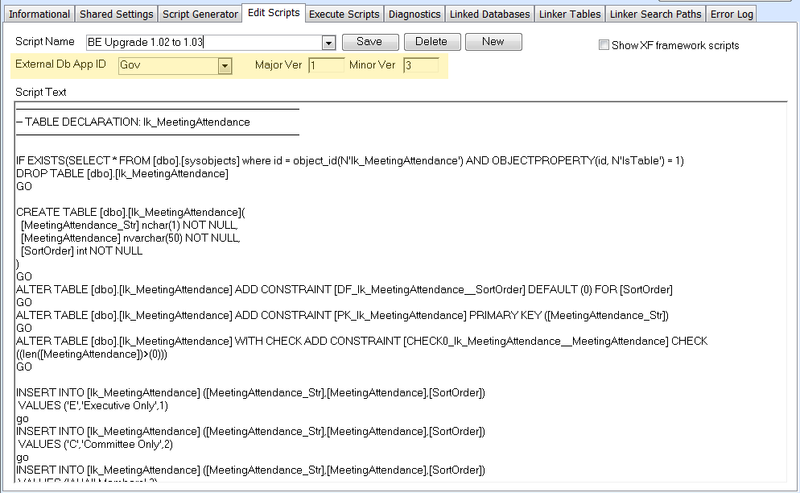 Enhances and replaces the built in VBA Collection class. 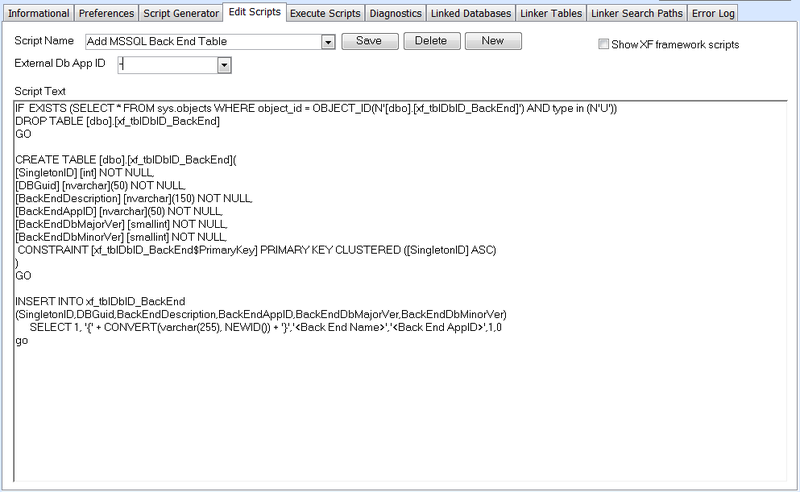 The dictionary allows iteration through the keys as well as the values, and has a lot of checks and balances and some debugging built in to make it less 'bare metal' than the VBA Collection. Encapsulates a database connection and provides methods for data to be extracted from it, whether DAO or ADO, local or remote. This class is used by the framework to pass to methods as a generic database wrapper, rather than having to have DAO/ADO versions of everything. 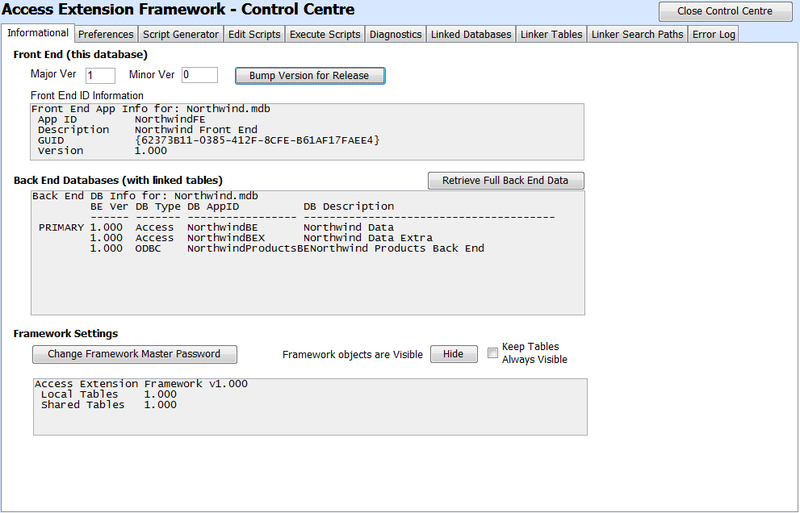 The default xf_DbConnect object is xf.DbConnect, which always refers to the current database. 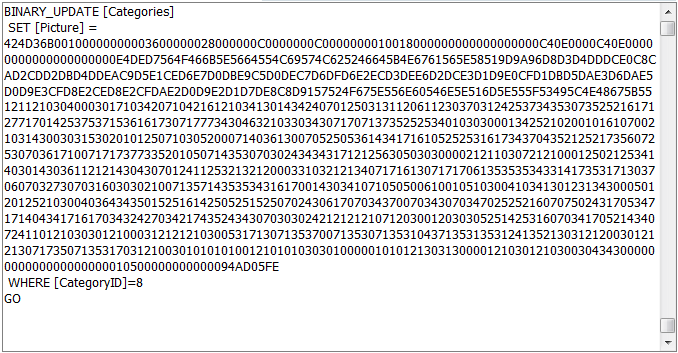 These objects are great for creating complex processing logic in VBA, given all the tools they bring with them. 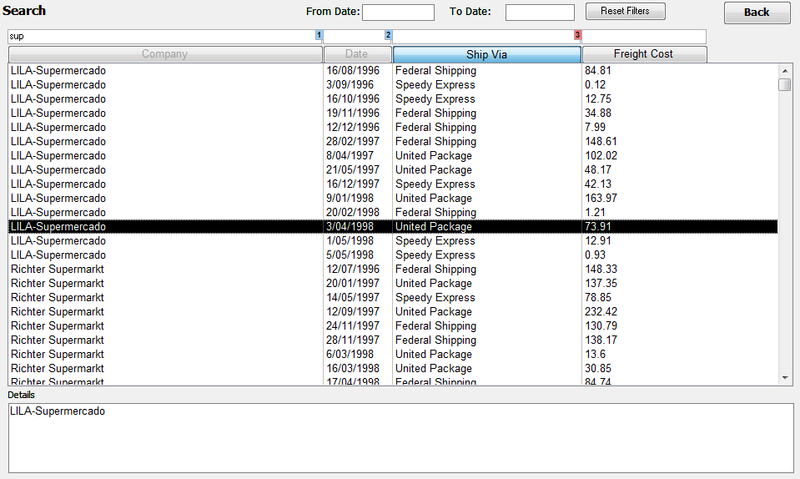 But the xf_DataList and xf_DataListExt objects can also be used as a datasource for ListBox and ComboBox controls, allowing innovative and lightning fast multi column search and filter screens to be created. A class to cache SQL result sets. 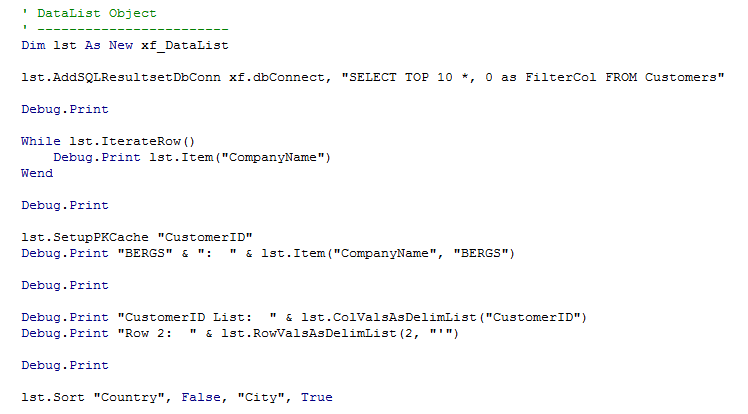 It returns a DataList object, fetching it from memory using the SQL as a key if it has seen the SQL before, or reading it from the database and storing it if not.